I was finally able to capture the third quarter of the moon with my Tudor telescope on the 13th of September just before sunrise. Using these images and my image of the full moon and the first quarter moon posted earlier I decided to put my art O Level to work and follow Harriot's example and create a hand drawn composite map from my photographs using black ink, and black and white pencils (I did achieve a grade B in my O Level art back in 1976. My art teacher who was a rather dour Mancunian commented at the time that “he thought the examiner must have been in a benevolent frame of mind when he marked my still life composition”). 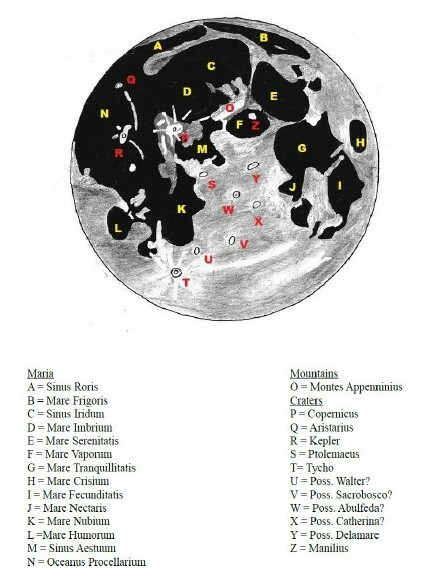 I have annotated the map with the names of the features that I could see. Conveniently there were 26. One for each letter of the alphabet. The Maria are all roughly in the right places and match modern maps reasonably well but also I could see 11 craters. I was able to positively six of them easily. I am totally confident that anyone who had pointed a Digges-Bourne telescope at the moon in the Tudor period would have seen these features on the surface of the moon. My map fits well between Gilbert's naked eye map and Harriot's map drawn with the aid of his Dutch Trunke. On my map features labelled Q, R, S, T, U, V, Y and Z overlay perfectly with Harriot's map. With the 3X magnification afforded by the Digges-Bourne telescope some lunar craters can clearly be seen. However, in the Tudor period as I will explain in a post to follow nobody had ever thought of there being craters on the Moon.